If you adore the look and feel of precious metals but can’t afford the hefty price tag, we may have just the solution you have been looking for. Our men’s titanium wedding ring with polished beveled edges offers the same lavishly silver hue of platinum, white gold, or silver at a fraction of the cost. This stunning wedding band was designed in a classic style and provides the highest strength-to-weight ratio of any transition metal in the world. Each 6mm men’s titanium wedding ring with polished beveled edges features a comfort-fit style, which means that it can easily squeeze over large knuckles. Best of all, the 6mm band isn’t too thin or too wide to distract from your unique sense of style. Each men’s titanium wedding ring with polished beveled edges features a flat profile for a contemporary appeal. Moreover, titanium never loses its shine and boasts superior resistance to denting, discoloring, and scratching. If you work with your hands or lead an active lifestyle, you can rest assured that this ring will withstand the wear and tear of your busy schedule. The satin finish strays away from the classic, but we implemented polished edges to provide a tiered effect to love for years and years to come. Celebrate your big day with a ring that is one-of-a-kind. 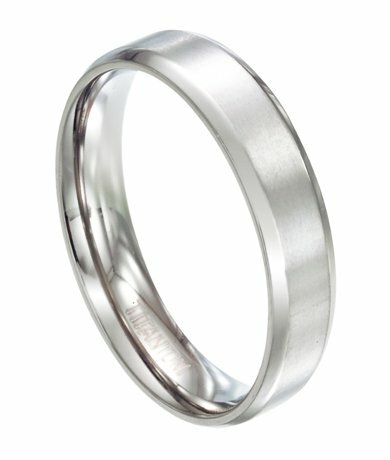 If you have any questions or concerns about our 6mm men’s titanium wedding ring with polished beveled edges, please contact a member of the JustMensRings.com customer service team for further assistance. Very good product, comfort fit is nice! This is how to fit your finger. measure your finger very tightly with a piece of paper and find the closest size. then from that size go 0.5 size down. I live in Canada, Waterloo. I've ordered twice and both times a they arrived in 11 days after ordering (not business days, just regular days). No customs fee needed. Such a good service. Beautiful ring, my husband loves it! It is a bit darker than the picture shows, so expect that when you order. It is not the nice silver color shown. This ring is definitely a good buy. The quality is outstanding. The thickness looks good and the polish on it looks like I spent over $100. It's lightweight and if you are thinking of purchasing this ring. DO IT! Arrived fast. Great ring for the money! Shipping was quick too.